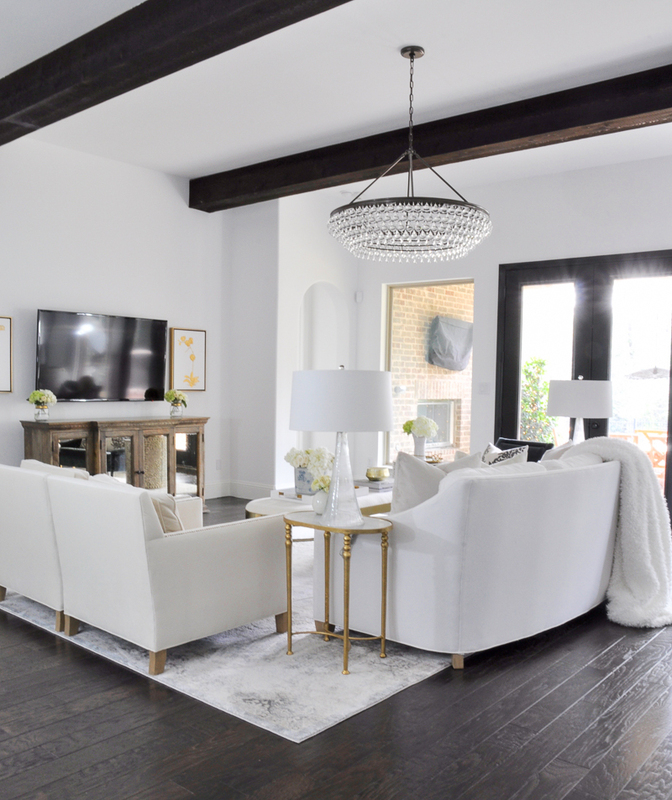 Your living room is such an important room to get right. You gather here as a family and entertain in it as well. Your living room needs to be beautiful AND comfortable, which can be challenging. 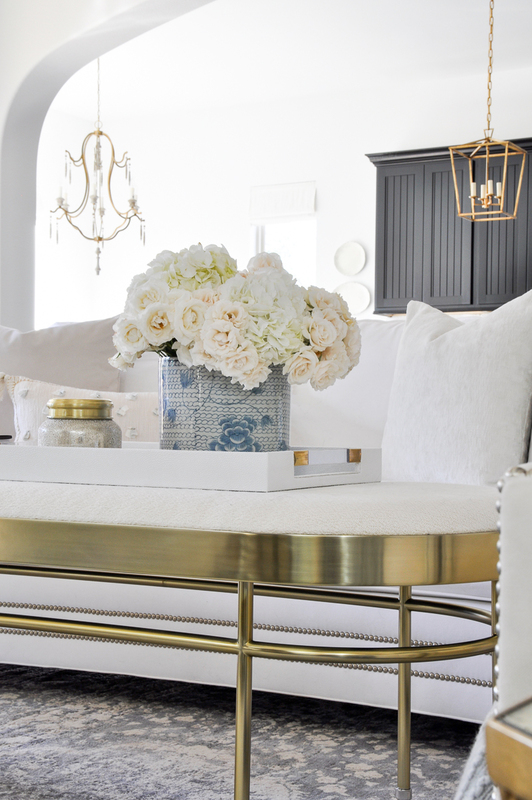 These are just a couple of points of consideration with a living room makeover. 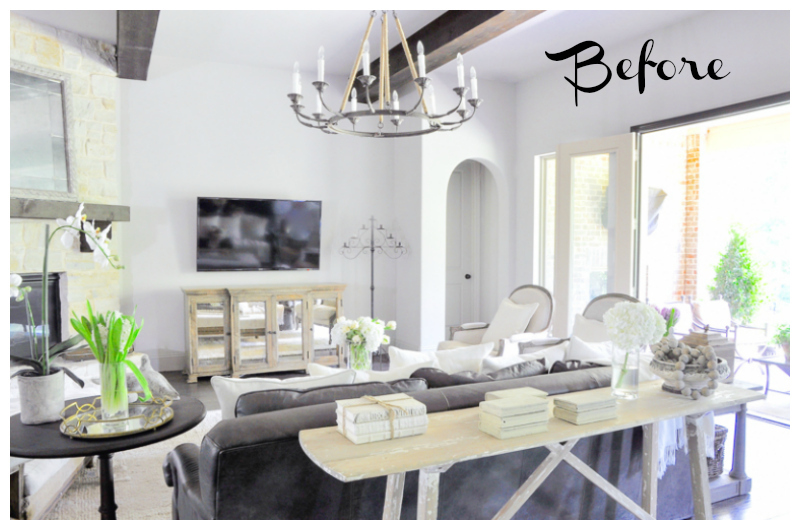 When I set out to begin our Texas living room makeover, I knew it was going to be a big project. I was excited and nervous about getting started. There were so many decisions to make. The only thing I knew for sure was that I wanted to change our chandelier and the stone around the fireplace. I wanted the room to be less rustic and more transitional. It is easy to get overwhelmed when you are making over a room as important as your living room. I will be the first to admit that the process challenged me. However, through it all, I learned a bit more about my evolving style and how to create a room that is far more fitting to my taste. This is what our living room looks like today. 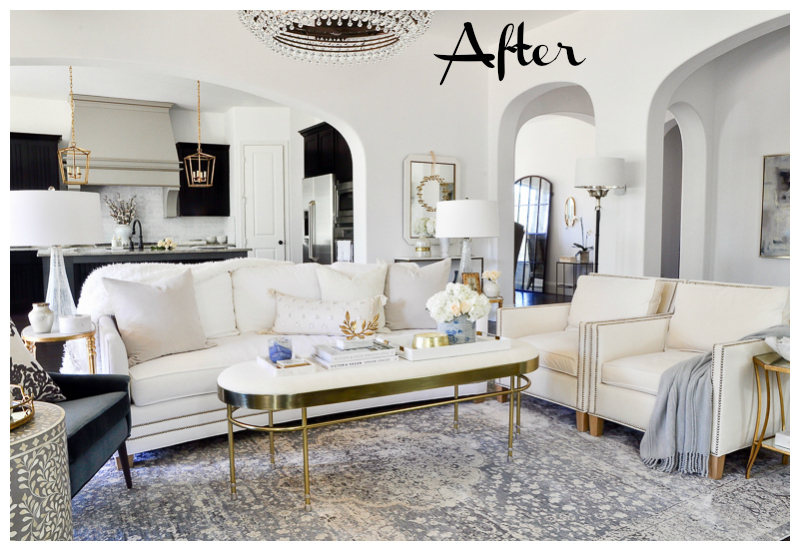 Today, I want to share the steps I took to makeover my living room. Are the pieces you currently have worn out? Are they the wrong size? Do you simply dislike them? 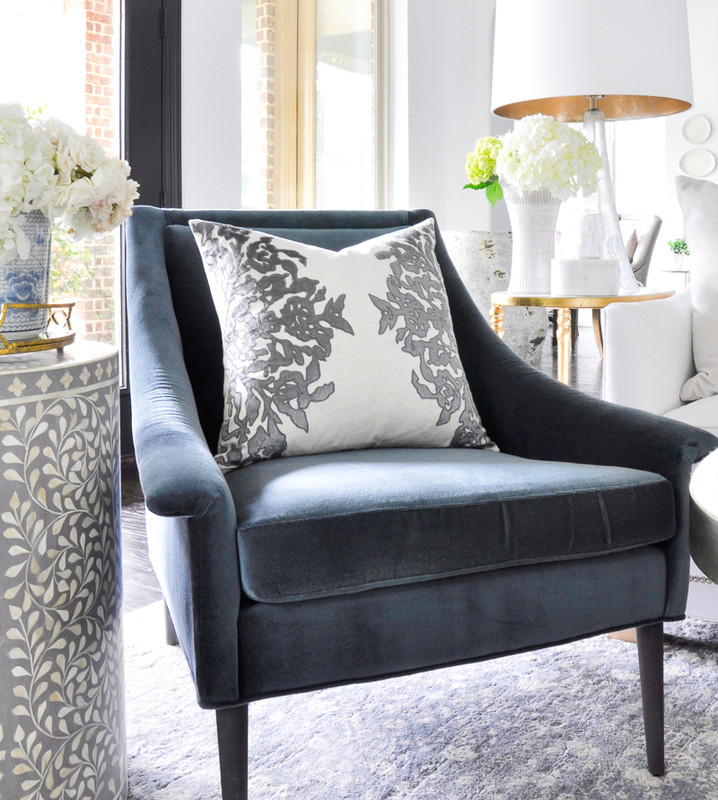 You can choose to reupholster a piece that you love (tips to help you know if it’s worth it here), but you should definitely decide what must go before you start spending money on your new design. It is wasteful to decorate around things that don’t work. I chose to only keep our buffet. We use the piece for storage and I still love it. The makeover should compliment and flow with the rest of your home, or the direction your home is going. 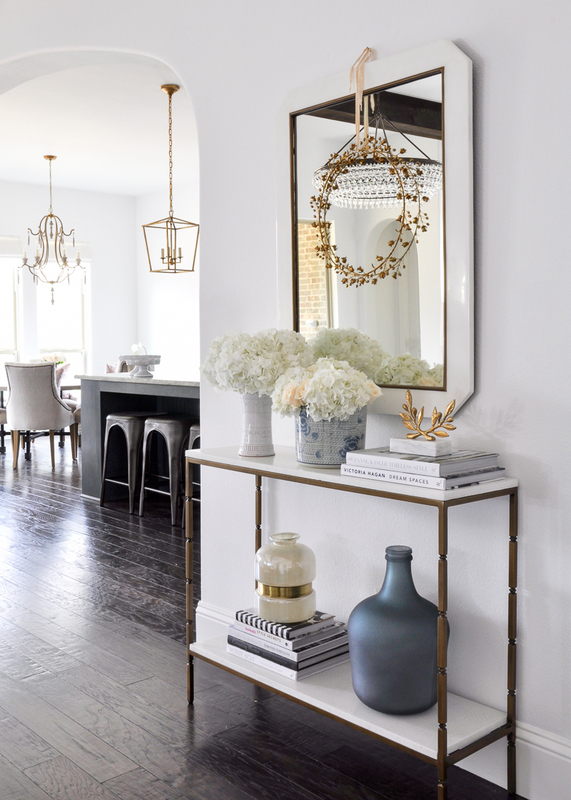 After recent updates in our dining room and master bedroom, and a decision to paint all of the open areas white, we knew the direction we were taking our decor. 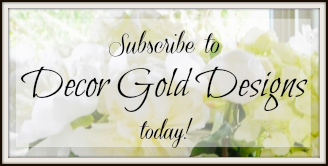 Try turning to Pinterest, Instagram, home decor blogs, and magazines to find a style that inspires you! The main color should be one you adore. Choose all colors for your home wisely, but remember, you can change the accent colors more easily than the primary color of each space. The more open your living room is to other rooms in your home, the more the other spaces should be considered. A well designed home should flow. The best way to do this is with continuity of color. This should also be a consideration when choosing your color scheme as well. 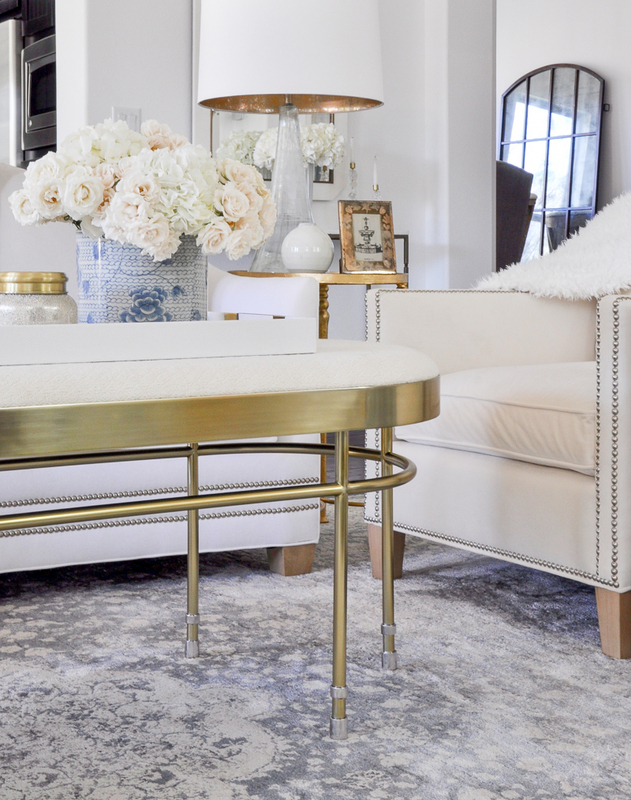 I carried the blue from my entry hall bench and the gold and white from my console area into my new living room design. 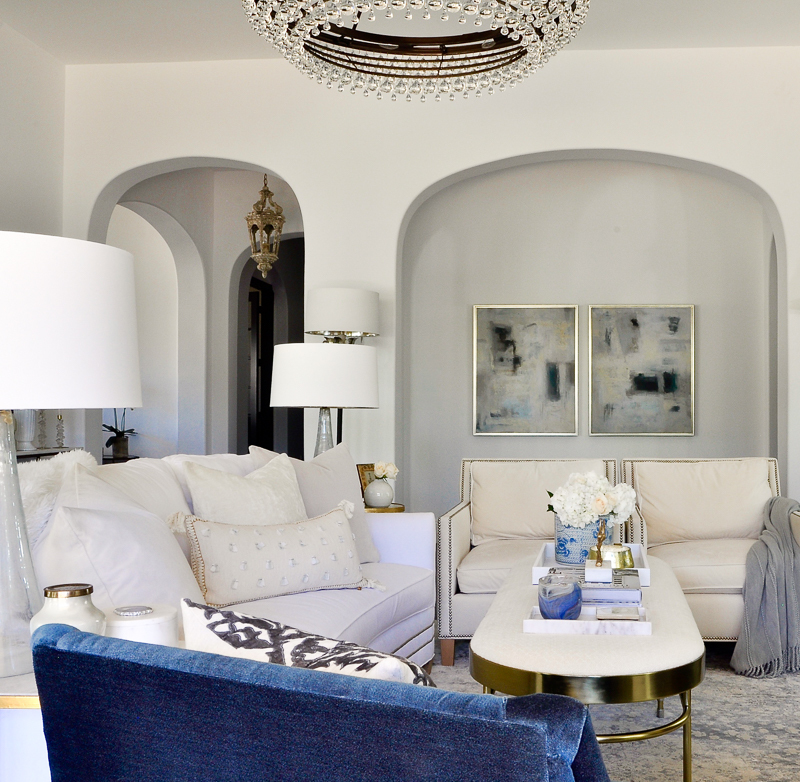 This includes large furniture pieces, rugs, your chandelier, and large art. 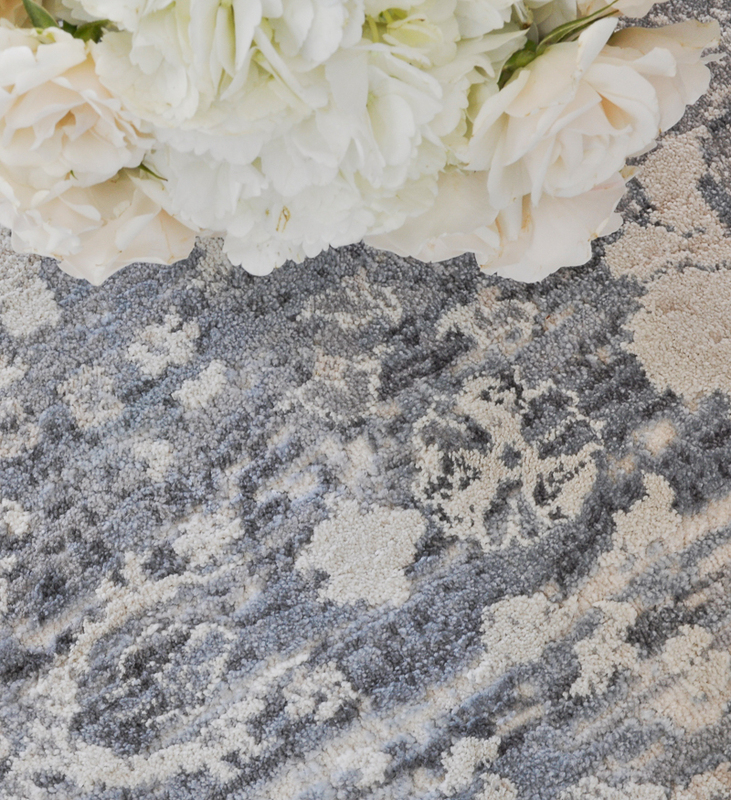 These items will command attention and will become the focal points within your new room. As I mentioned earlier, I knew I wanted to change our chandelier. I found one that I was in love with, BUT it was very expensive. So, I found a “look-alike” at Lighting Design. I wish you could see it in person. It’s so beautiful and it completely changed the look of the room. Here it is turned on. Additionally, when looking for statement pieces, it is important to consider scale. 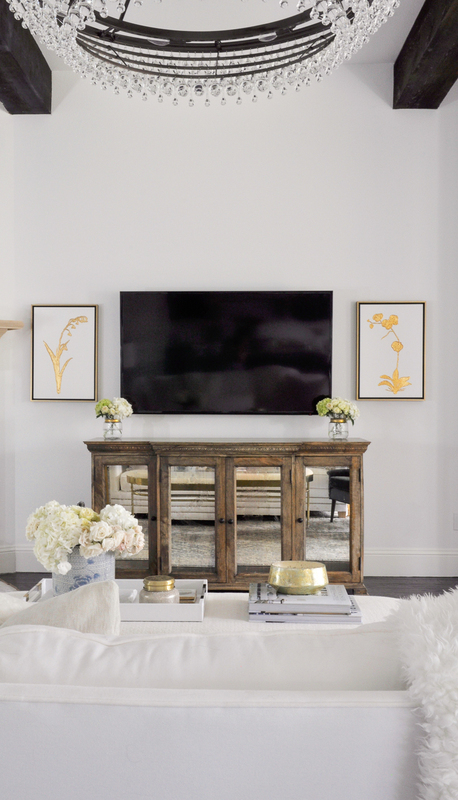 Using small scale pieces in a large room or large scale pieces in a small room almost never works. Our new sofa is has a tall back which is appropriate for our ceiling height. Because our living room is open, I wanted a slightly larger rug with some color and pattern to define the space. I found this one at High Fashion Home, where I also found my new art and blue velvet chair. 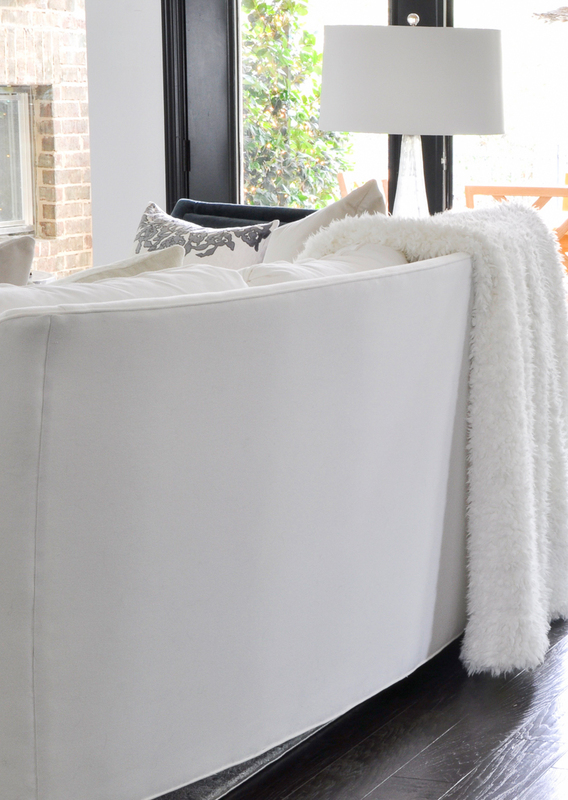 Each piece helped add personality to my predominantly white living room. Secondary pieces will fall into place more easily once the primary pieces are purchased. Secondary pieces include things like side tables, lamps, and art pieces. These pieces provide a lot of my gold accents, color, and texture. This is my favorite step. Accessories are the icing on the cake. 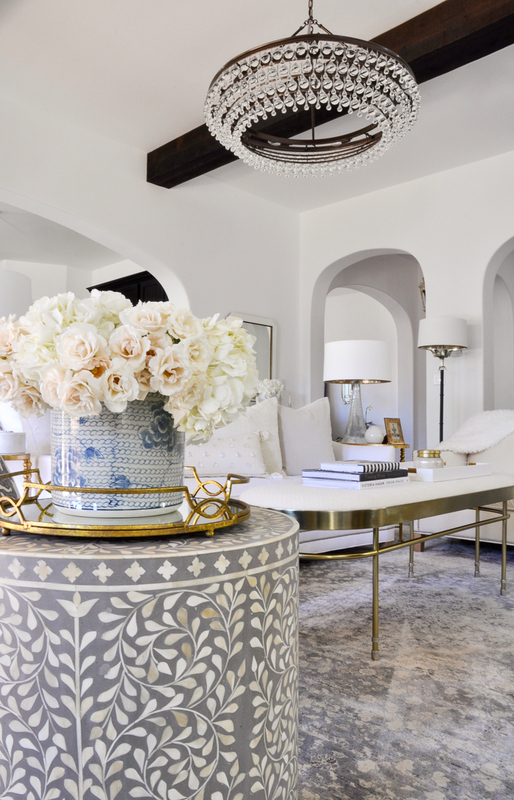 They fill the gaps and create a cohesiveness within the room and design theme. 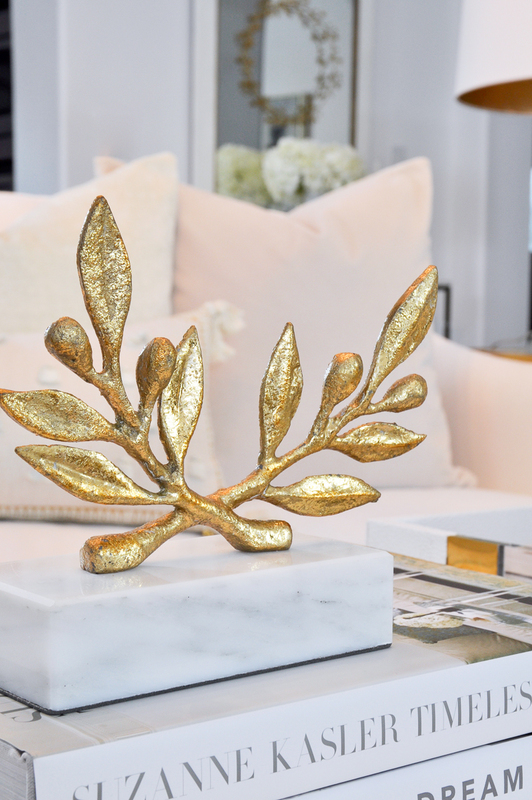 I recommend choosing items that can be used in multiple spots in your home so you can keep your room fresh by easily restyling your accessories. 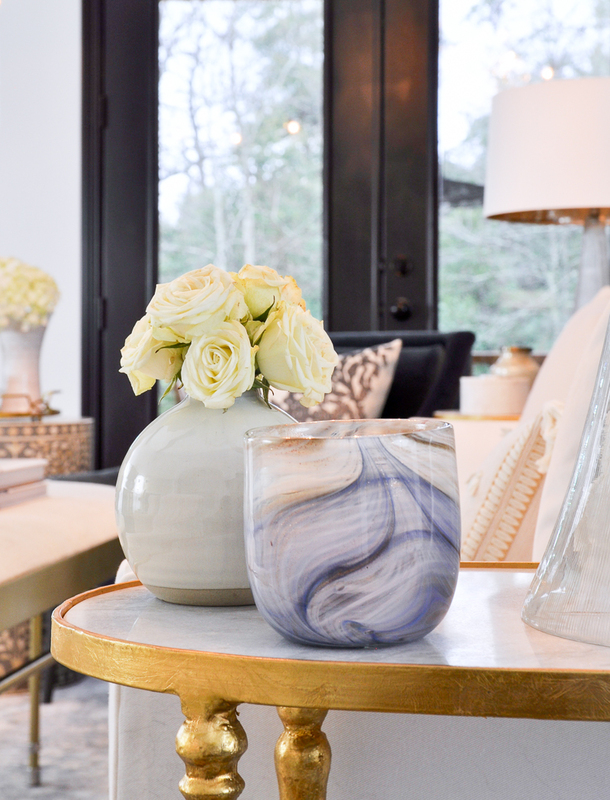 My go-to accessories include trays, vases, candles, decorative boxes, objects, throws, pillows. I’ll be talking more about accessorizing soon, but please visit my accessory page for lots of current finds! I hope I’ve given you the confidence to plan a makeover of your own! Remember, it is a long process and a clear vision of your style and statement pieces is a great starting point. Most importantly, enjoy the journey! Thank you Bree! I’m loving the bright new look, especially since it’s overcast so often where we live! You will definitely have to come over!!! Your makeover is beautiful as is all of your beautiful posts. I have been following your blog for some time now…you are one of the bloggers that inspired me to start blogging myself!! I have such a long way to go….Your site is gorgeous! Very pretty. I love the added blue. The rug is perfection! I have a ? I see your fireplace in the before photo. How is the rug positioned in relation to it? Wonderful post! Beautiful redesign! But I’m just wondering where you plug in the table lamps on the sides of your couch, being that it’s in the middle of your room? 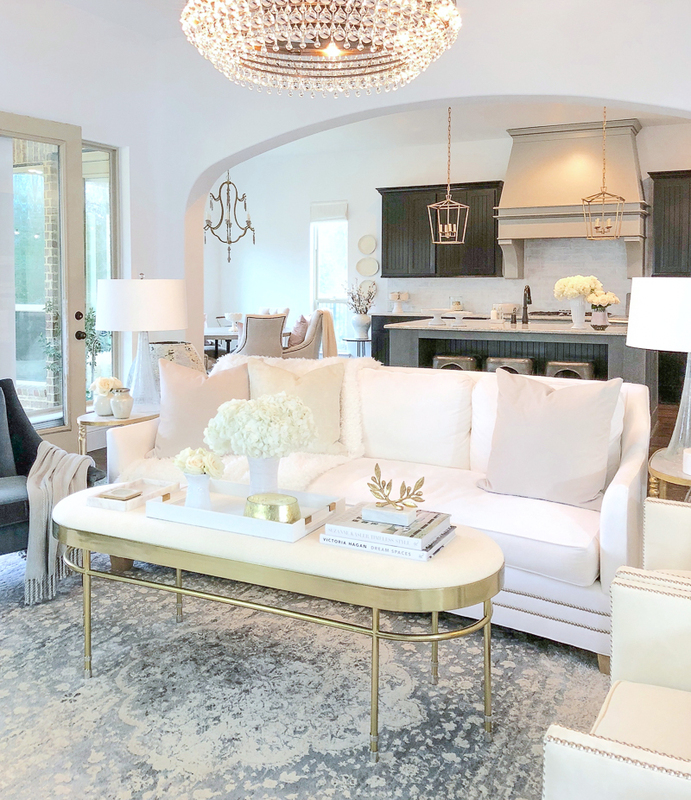 Love it 😍 what is the name of the chandelier in living room? Jennifer, you so inspire me. As I’m readying my house to put on the market (and trying to do it inexpensively), I’m finding your tips to be so useful. I was so excited today to find a vase at Target on sale, that is similar to yours with the copper band. My dining room will look so nice. Thanks for your great tips. Hi there- the room is gorgeous, as is your site. I love your style. 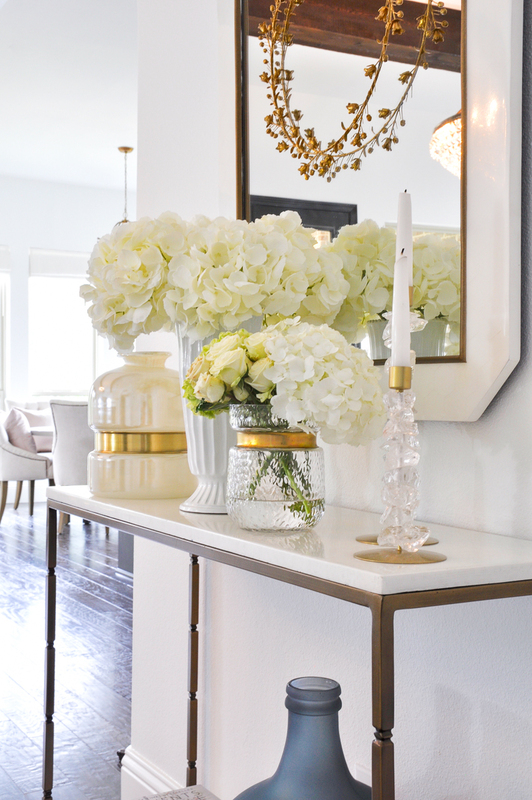 I think one of the links is not working, I like the tall white ribbed vase on the console table; the link takes me to a site with similar pieces, but I don’t see that vase? Hi Desiree! Thank you so much! I checked it and it appears that particular vase is currently out of stock, so the link is going to other pieces in the same collection. Hopefully it will come back in stock soon!